Plastid precursor proteins (preproteins) are synthesized in the cytosol, guided to plastids by an N-terminal amino acid extension, and post-translationally imported. The latter depends on a translocon in the outer envelope membrane of chloroplasts (TOC). Malfunctioning of the TOC complex leads to severe defects in organelle biogenesis and cell function. The recognition of preproteins at the organelle surface is thought to be central for discrimination of proper substrates, especially due to the co-existence of mitochondria and plastids within plants. The two GTPases Toc34 and Toc159 (TOC subunits of 34 and 159 kDa) are discussed to regulate the translocation of preproteins across the outer membrane. GTPases are central for many other protein transport processes, like vesicular transport or signal recognition particle recognition at the endoplasmic reticulum membrane. Today, three general concepts have been proposed for GTPase regulation based on (i) a GTPase activating protein (GAP), (ii) GTPase activation by dimerization (GAD), and (iii) GTPase inhibition by dimerization (GID). The current results suggest that the TOC-system unifies two regulatory concepts. While we documented that Toc34 undergoes a GID-type regulation our initial results speak in favor of a GAP type regulation of Toc159. A current hypothesis considers Toc159 as central regulator before translocation. Thus, the definition of the functional cycle of Toc159 in the context of the other TOC components like Toc34 or Toc75 will be in focus of our investigation of the mode of protein translocation into chloroplast in the next funding period. We will explore functional and structural properties of the domains of Toc159 in combination with other complex components to reconstitute individual interactions and structural transitions. This information will be integrated into the functional and structural description of the entire TOC complex isolated from chloroplasts. Complementary, the TOC complex compositions in various plastid forms and the post-translational modification of TOC components isolated from plastids of stressed plants will be investigated to define the regulatory processes and to generalize the information obtained for chloroplast TOC. The combination of the three distinct strategies will ensure that enzymatic properties will be linked to the functional context to describe the processes during protein translocation. The regulation of the Toc-complex. At first, Toc34 recognizes the incoming plastid preprotein at the chloroplast surface. In a GTP-dependent manner (left) the protein is handed over to the main import receptor Toc159 (bottom), which subsequently facilitates the insertion of the protein into Toc75-channel (right). By GTP to GDP exchange, the complex is regenerated for a new import cycle (top). Phosphorylation of either Toc34 or Toc159 impedes the complex by dissociation of Toc34 (top-right). Center: crystal structure of the Toc34 GTPase domain (Koenig et al., 2008). Nicolaisen K, Missbach S, Hsueh YC, Ertel F, Fulgosi H, Sommer MS, Schleiff E (2015) The Omp85-type outer membrane protein p36 of Arabidopsis thaliana evolved by recent gene duplication. J Plant Res 128, 317-25. Hsueh YC, Flinner N, Gross LE, Haarmann R, Mirus O, Sommer MS, Schleiff E (2015) The chloroplast outer envelope protein P39 in Arabidopsis thaliana belongs to the Omp85 protein family. Proteins [Epub ahead of print], Doi: 10.1002/prot.24725. Lumme C, Altan-Martin H, Dastvan R, Sommer MS, Oreb M, Schuetz D, Hellenkamp B, Mirus O, Kretschmer J, Lyubenova S, Kügel W, Medelnik JP, Dehmer M, Michaelis J, Prisner TF, Hugel T, Schleiff E (2014) Nucleotides and substrates trigger the dynamics of the Toc34 GTPase homodimer involved in chloroplast preprotein translocation. Structure 22, 526-38. Flinner N, Ellenrieder L, Stiller SB, Becker T, Schleiff E, Mirus O (2013) Mdm10 is an ancient eukaryotic porin co-occurring with the ERMES complex. Biochim Biophys Acta 1833, 3314-25. Leibovitch M, Bublak D, Hanic-Joyce PJ, Tillmann B, Flinner N, Amsel D, Scharf KD, Mirus O, Joyce PB, Schleiff E (2013) The folding capacity of the mature domain of the dual-targeted plant tRNA nucleotidyltransferase influences organelle selection. Biochem J 453, 401-12. Paul P, Simm S, Blaumeiser A, Scharf KD, Fragkostefanakis S, Mirus O, Schleiff E (2013) The protein translocation systems in plants - composition and variability on the example of Solanum lycopersicum. BMC Genomics 14, 189. 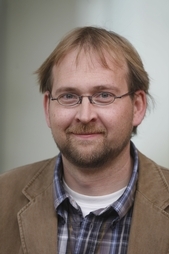 Rudolf M, Machettira AB, Groß LE, Weber KL, Bolte K, Bionda T, Sommer MS, Maier UG, Weber AP, Schleiff E, Tripp J (2013) In vivo function of Tic22, a protein import component of the intermembrane space of chloroplasts. Mol Plant 6, 817-29. 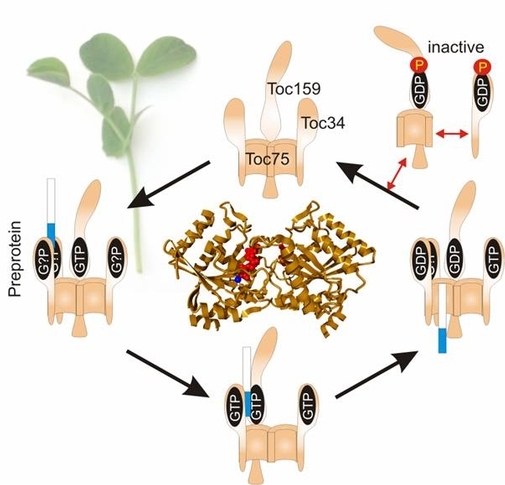 Sommer M, Rudolf M, Tillmann B, Tripp J, Sommer MS, Schleiff E (2013) Toc33 and Toc64-III cooperate in precursor protein import into the chloroplasts of Arabidopsis thaliana. Plant Cell Environ 36, 970-83. Ulrich T, Gross LE, Sommer MS, Schleiff E, Rapaport D (2012) Chloroplast β-barrel proteins are assembled into the mitochondrial outer membrane in a process that depends on the TOM and TOB complexes. J Biol Chem 287, 27467-79. Tripp J, Hahn A, Koenig P, Flinner N, Bublak D, Brouwer EM, Ertel F, Mirus O, Sinning I, Tews I, Schleiff E (2012) Structure and conservation of the periplasmic targeting factor Tic22 protein from plants and cyanobacteria. J Biol Chem 287, 24164-73.